Numismatic Guaranty Corporation, Numismatic Conservation Services and Paper Money Guaranty recently exhibited at the Korea Money Fair in Seoul, Korea and the Beijing International Coin Exposition in Beijing, China. NGC has certified the first 2014 Chinese Silver Panda Coins. An example of one of the coins is shown above. 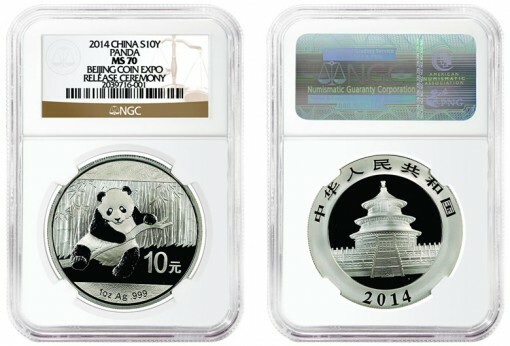 Of particular note in China, NGC graded and encapsulated the first 2014 Chinese Silver Panda Coins, the company stated. It is estimated only 200 of the 2014-dated coins were released via an invitation-only ceremony at the Beijing Coin Expo on Friday, October 11, 2013, by China Gold Coin Incorporation (CGCI), the official distributor of precious metal coins for the People’s Bank of China. Regular full distribution of 2014 Chinese Panda Silver Coins are expected to begin sometime in November. Panda coins are the most widely collected modern Chinese issues, and they feature a different design every year. The series began in 1982 with four gold medals, which were followed in 1983 by the popular silver 10 Yuan coins. Collectors and dealers took advantage of their early opportunity to get their 2014 Chinese Silver Panda Coins graded at the Beijing Expo, and a special NGC pedigree called, "BEIJING COIN EXPO RELEASE CEREMONY," was assigned to them. This pedigree will be available as long as NGC receives submissions in the original green presentation box by Nov. 1, 2013. Hwadong and Guangzhou National Standard Numismatic Collection Grading Co, Ltd., respectively, represented the companies’ official submission centers in Korea and China. Demand was high at both shows for expedited grading specials and for regular NGC, NCS and PMG submissions, according to a news release. "We are very pleased by the successful Korea Money Fair and Beijing International Coin Exposition, and are honored by the support we have received from collectors and dealers in Asia," said Steven R. Eichenbaum, CEO of CCG. "NGC, NCS and PMG have had a presence in Asia for nearly a decade and interest in our expert services continues to grow every year." NGC has graded more than 635,000 Chinese coins and nearly 35,000 Korean coins. PMG has certified more than 80,000 Chinese notes and more than 70,000 Korean notes. NGC, NCS and PMG belong to, as independent members, the Certified Collectibles Group® (http://www.collectiblesgroup.com). Plans are underway for CCG to open an office in Shanghai and another in Hong Kong, China later this year.